WYTHENSHAWE HOSPITAL is to be rebuilt, at a cost of �0m. When complete, the hospital will have a new acute unit, six new operating theatres, a burns unit and an accident and emergency unit. While the announcement has been generally welcomed, some have criticised the fact that some of the money is coming from private sources. Co-incidentally, there was a fire in one of the operating theatres at Wythenshawe Hospital. No-one was injured, though it's reckoned the theatre won't be in use again for another twelve days. And Withington Hospital, which had been under threat of closure for some time, is now to become a "community hospital" (I'm not exactly sure what this means!). AS PART OF TONY BLAIR'S plans for a "National Grid for Learning", libraries in the North West are going to get almost �in funding. Manchester City Council will get �1, 388, and Salford will get �,000. As a regular user of Manchester Central Library, I definitely welcome this development. Hopefully, they'll spend the money on new computer terminals so more people can plug into Eyewitness in Manchester! WHAT HAPPENED TO THAT SUNNY WEATHER? 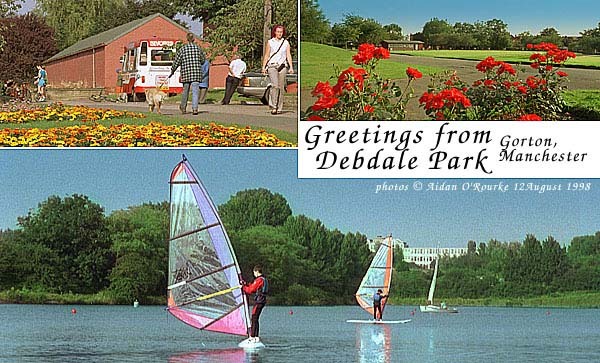 IT SEEMED LIKE SUMMER as I walked round Debdale Park on Tuesday, but today has been cloudy and overcast. Temperatures are on a downer and the forecast for tomorrow doesn't look good! Current EWM temperature is 57/14. Glad you like the piccies. 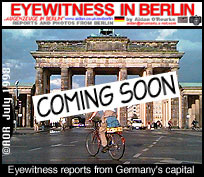 Watch out for Eyewitness in Berlin, coming soon! Hi Aiden , I was beginning to suffer withdrawal symptoms . I was taken with the photograph of Worsley . My wife and I walked this area during our early years ( 50 years ago ) before we married . Back come the memories and I am once more young ( I will not say "and foolish" ) and perhaps care free . Thank you once again for the work you put into this link with my past . Incidentally its 20 celsius and sunny here in Kiama , Australia . Hope you get some good weather soon . I was only away for five days. What's going to happen if I go on a longer holiday? I guess Eyewitness in Worsley is more interesting to you than Eyewitness in Benidorm! Thanks for the message - we got the good weather - for a day! Greetings from Tampere, Finland. Just sat here browsing through your wonderful collection of photos of my home town of Manchester. 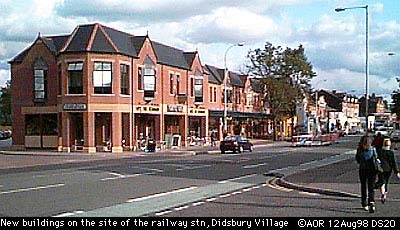 Wondered if you had any more pics of the Didsbury area? I would love to see pics of the village and Fletcher Moss Park on the net. I used to live in Didsbury & in Burnage so I would be grateful if you could help me out. Do you know of any web-sites featuring either of these places by the way? Sorry, don't know of any websites. For more pictures of Didsbury, try 200 and 242 from the Image Collection. More soon. My name is Yuka Takahashi studying about Urban Regeneration in the graduated school in Tokyo as well as working at Tokyo Convention and Visitors Bureau. I am very interested to take Manchester's case in my research. It wold be very kind of you if you could let me know how to refer Manchester Eyewitness according to Manchester's city regeneration started in the late eighties. Or, are there any other ways to collect information about it ? About your site, it is very enjoyable and comprehensive. I enjoy with it a lot. At the same time, it is very helpful because it is not that easy to get info about Manchester or other UK cities except London, being in Japan. I hope to hear from you and thank you very much in advance. Thanks very much for the message. I started Eyewitness in Manchester in January 1997, so I don't have much information from the time before that. You might find my Manchester 1948/1998 pages interesting. Possibly also Euan Kellie's Rebuilding Manchester website. Is there anyone out there who can help Yuka with information about the regeneration of Manchester in the late 1980's?